It has been almost 50 years since humans first stepped foot on the Moon. A flurry of manned and unmanned missions made their mark on the lunar surface from the late 60s to the mid 70s. While a number of missions have studied our cosmic satellite from afar, only one rover has landed on the moon since then. The Chinese Chang’e 3 lander and Yutu — or Jade Rabbit — rover touched down on December 2013. The tiny, six-wheeled, solar-powered rover operated on the lunar surface for around three years. Now the Chinese National Space Agency is planning to send a new lander and rover to the moon. But this mission will go where no spacecraft has ever gone before. Due to launch in December, the Chang’e 4 mission plans to explore the far side of the moon. The mission is part of China’s ambitious push to explore the moon’s resources and potential as a space base — with a following mission next year to recover samples of the moon’s surface for study on Earth. Pink Floyd might have called it the dark side of the moon, but the far side of the moon is not dark at all — at least when it comes to sunlight. The moon takes the same time to spin on its axis as it takes to complete one full orbit, so we only see one side of the moon from Earth. “We never see the far side of the moon, but it does get sunlight,” explained Brad Tucker, an astrophysicist from the Australian National University. Over the years, several orbiting crafts have mapped the far side. The dominant feature is the 2,500km-wide South Pole-Aitken basin, the moon’s oldest and deepest crater. The Chang’e 4 spacecraft is predicted to land somewhere in the South Pole-Aiken basin (shown in purple). The geology of this basin may help us understand how the moon formed, Dr Tucker said. Its unique geology is a major attraction, said Warwick Holmes, executive director of space engineering at the University of Sydney. “If they can land on this and do some direct measurements of the surface, they’re going to find some more exotic minerals that have never been seen before,” Mr Holmes said. Because the far side faces away from Earth, it is also shielded from radio transmissions. This makes it the perfect place from which to study the universe, Dr Tucker said. “The far side of the moon has actually been a fascination of astronomers and space scientists for decades because it’s this perfectly quiet place,” he said. Why haven’t we been to the far side before? Radio darkness makes exploring the far side extremely challenging, which is why it has not been attempted until now. To be successful, a mission must be able to communicate with Earth. But how does a spacecraft do this from the other side of the moon? In May, the Chinese space program launched the Queqiao — or Magpie Bridge — communications satellite to overcome this problem. Named after a Chinese folk tale where the magpies of the world form a bridge to reunite lovers in the Milky Way, Queqiao now orbits a point behind the far side of the moon. “There’s a point about 60,000km behind the far side of the moon out in space which is gravitationally stable,” Mr Holmes said. 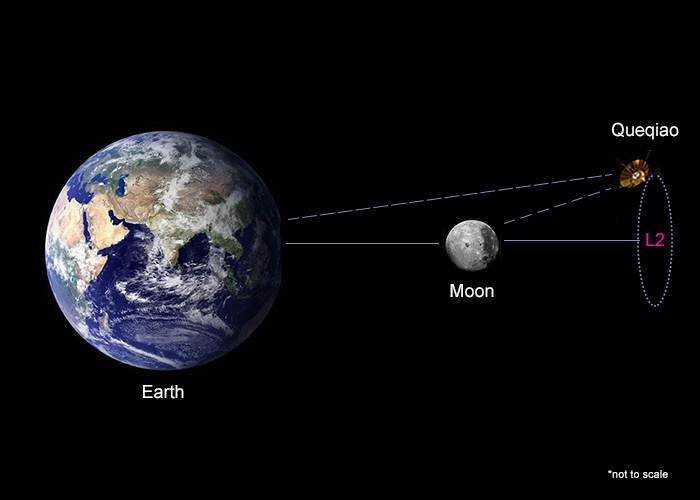 This point, known as the Lagrange 2 (L2) point, moves with the moon as it orbits Earth. “If you put a satellite at this L2 point, it will just stay there without using any fuel,” Mr Holmes said. “It’s an incredibly clever utilisation of a gravitational special effect to put a pseudo-stationary satellite as a relay station for the far side of the moon exploration. What will the ‘goddess of the moon’ mission look like? Officials have not confirmed where the spacecraft will land, but the target is predicted to be the 180km-wide Von Karmen crater in the middle of the South Pole-Aitken basin. Last month, Chinese officials unveiled images of the Chang’e 4 — which means goddess of the moon — lander and rover at a press conference in Beijing. The lander is similar to Chang’e 3, with the addition of three 5-metre antennae. The rover, which will be officially named in October, is similar to its predecessor Jade Rabbit, said Wu Weiren from the Chinese Academy of Engineering. “The rover is the lightest of its kind in the world. It weighs only 140 kilograms, while its predecessors were much heavier,” Mr Wu told the China Daily. The fridge-sized probe will be equipped with cameras, spectrometers and radars to view and measure the terrain and underlying geology of the moon’s surface. Image revealed by the CNSA of the Chang’e 4 rover, to be officially named by competition in October. It will need to survive temperatures that range from 127 degrees Celsius during the day and minus 173C during the night. The lander and the rover will include a range of scientific experiments for multiple countries. “The rover and satellite are built by China, but they have instruments from Germany, Sweden, the Netherlands and even Saudi Arabia,” Dr Tucker said. “And that’s where it’s becoming a very international thing. The moon is the perfect place to test our ability to survive away from Earth. “If we are serious about these expeditions to Mars, we have to develop the systems for sustaining life autonomously for very long periods of time — without any human assistance — on the moon first,” Mr Holmes said. “The brutal reality is, any human missions will not be going to Mars in the next 30 years. “It’s been a mystery to me why there’s been so much focus on Mars. Chang’e 1 China’s first lunar mission launched in 2007. It orbited the moon and created a topographical map of the surface. Chang’e 2 A second orbiting mission in 2011 to scout for future landing sites as well as taking high-resolution photos. Chang’e 3 First unmanned moon landing of the Chang’e effort. The lander with Jade Rabbit touched down in 2013, making it the first soft landing on the moon since 1976. Despite some technical issues, the rover functioned until 2016 when it was officially declared dead. Chang’e4 China’s current mission to explore and research the far side of the moon. Chang’e 5 Future mission slated for 2019 to collect and return lunar rocks and soil. Some of the experiments aboard Chang’e 4 investigate the moon’s potential to support future space travellers. One of these experiments is a biosphere project, which includes silkworm eggs, thale cress and potato seeds. If it goes to plan, the ecosystem will be self-sustaining, with the silkworms germinating the potatoes and popping out caterpillars. These will then in turn produce carbon dioxide, which helps the plants grow as a food source. Meanwhile, a Swedish-built instrument will look at how the solar wind, which carries hydrogen, interacts with minerals on the surface of the moon. Interaction between the solar wind and the moon’s surface could theoretically produce water. Scientists recently confirmed water ice exists in permanently shaded areas at the poles, boosting the moon’s potential as a habitable environment. These experiments could not only benefit China, which has expressed a desire to send humans to the moon by 2030, but a number of other nations and private companies. India also plans to send a rover to the moon’s south pole as part of its Chandrayaan-2 mission by the beginning of next year. Listen as we explore the Chinese space program on The Science Show.